The most apparent features of Nav Bharat Jagriti Kendra (NBJK) are its size in terms of outreach, and the diverse nature of its programs. NBJK boasts of a total program outreach of 206,000 individuals in Jharkhand across 50 districts, in the areas of education, health, micro-finance, sanitation, advocacy and disaster relief. The state of Jharkhand is one that struggles with serious issues like poverty, severe lack of infrastructure, illiteracy and corruption, and therefore any progress becomes all the more meaningful to the beneficiaries in the state. NBJK has witnessed significant success since its inception in 1971, and can be considered as one of the front-runners for development in Jharkhand. While the endemic challenges still remain, NBJK has managed to make its mark through large-scale initiatives, and representation on prestigious national forums such as Planning Commission committees and the National Literacy Mission Council. Total Income: In terms of overall income, NBJK witnessed an increase of just about 3.3% in FY13 (Rs164.2mn as compared to Rs159mn in FY12), which is much lower than the past three years’ average increase (7%). 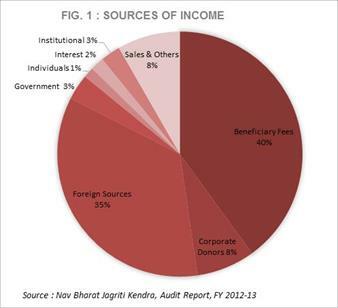 The main source of income for NBJK remains fees from beneficiaries (40% of total income in FY13), with income from foreign sources coming in as the second largest source of funds (35% in FY13) (Ref: Fig.1). It appears that NBJK does not place much reliance on the standard sources of funding, i.e. government, institutional and individual; income from these sources all fell within the range of 2-4% of total income in FY13. Corporate funding was at a marginally higher level, amounting to 7.7% in FY13 (Rs12.7mn). Beneficiary Fees: Fees are raised from beneficiaries in the form of tuition fees from the education programs, patient fees from the hospital-based programs and service charges from the micro-finance program. The quantum of fees raised from these three heads each is almost equal, and amounted to a total of Rs65.6mn in FY13. Revolving Fund for Micro-financing: NBJK has an earmarked revolving fund for the purpose of its micro-finance scheme. The fund reflects the amounts that have been specifically donated for the purpose of micro-financing, and currently stands at Rs15.6mn, which is almost unchanged since FY11. Additionally, NBJK also utilises general funds for the purpose of lending. As on FY13 year end, the total amount of outstanding loans (before provision for loss) was Rs87.2mn. Write-off of bad debts has reduced in FY13, and amounted to Rs1.1mn as against Rs3.9mn in FY12. Foreign Funding: NBJK has been able to garner significant support from foreign funders, particularly institutional donors from the US and Europe. Income from these sources amounted to Rs57.1mn in FY13, and was mainly in support of the education and health-based programs. Sales: Income generated from recycled waste products amounted to Rs7.2mn in FY13. There has been no specific trend in income from this source. It contributed to about 4.4% of total income in FY13 (Ref: Fig.1). Program Expenses vs. Overhead Expenses: NBJK expended about 53.5% of its outflows in FY13 directly towards program-related activities (Ref: Fig.2). The relatively high quantum of overhead expenses (29%) is due to its infrastructure-based programs in education (schools, hostels) and health (hospitals). NBJK did not have any expenses directly attributable to fundraising in FY13, or in the 3 prior years analysed. Fixed Assets: Fixed Assets as on FY13 year-end amounted to Rs47mn (after depreciation), which included Rs29.3mn in immovable assets in the nature of land and building. NBJK follows the practice of charging assets acquired out of grant funds to the Income and Expenditure Account. Further, assets donated through the grant-based programs are reflected in an “Assets Fund” and depreciation on the same is charged against this fund. In FY13, depreciation of Rs4.7mn was charged to the Assets Fund, which stood at Rs39.65mn at the year-end. Investments: The balance of investments recorded at the end of FY13 amounted to Rs25.1mn, which was almost 5x that of the previous three years’. This indicates better application of idle funds held by the organization. Income Growth Rate (IGR): Although the ability of NBJK to raise a reasonably large amount of funds has remained consistent, there has been minimal increase seen in the IGR. While the income in FY11 increased by 16% over the previous year, the IGR in FY12 and FY13 was 1.2% and 3.3% respectively, which indicates challenges in increasing scale of operations in the future. Self-Sufficiency Ratio (SSR): The SSR of the organization has remained 70% over the past two years, increasing from 60% in FY11. The main reason attributable to the SSR being at this level is the large amounts of income generated through beneficiary fees, sale of recycled waste and investment income, which together accounted for around 50% of the total income in FY13. This indicates a fairly stable stream of funding, which is a positive indicator from a sustainability point of view. Corpus and Reserve Funds: While NBJK does not have any funds designated to the corpus, it does have a large amount of accumulated surpluses (Rs173.8mn as on FY13 year-end). 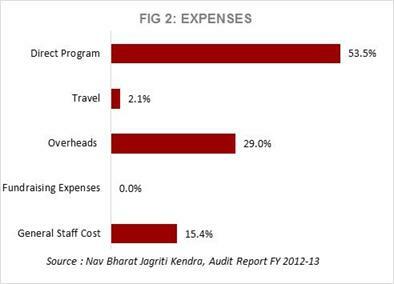 To put this in perspective, the overall expenses for FY13 amounted to Rs137mn. Therefore, it can be concluded that NBJK has reasonably large reserves to rely on in the event of a funding gap in the future. Donors tend to fund only in the short term: The trend observed is that even large institutional donors tend to support projects for only up to 3 years. This poses a great fundraising challenge to the organization, as large-scale projects tend to require at least 5 years to bring about meaningful impact. Lack of support from the Government: Despite NBJK’s scale and existence for over 40 years, the funding from government sources is still only 3% of the total income. This is a strong indication of deep-rooted inefficiencies / corruption in the system, as an organization that has set up schools, hospitals, micro-finance programs, etc. and attends to the needs of over 200,000 beneficiaries ought to have received more support from government authorities. NBJK has to accordingly look to outside sources to raise funds for its programs. The local Government also tends to favour collaborations with smaller NGOs for public-private partnerships, as they are probably easier to control. Retention of staff: NBJK, like most non-profit organizations, faces pressures to keep staff salaries at a minimum level to be able to submit modest annual budgets to potential donors. As a result, they have been facing difficulties in finding and retaining the right kind of staff members on the team. Challenges of the State: Jharkhand is one of the more backward states in India, and still struggles with deficiencies in transport systems, schools, medical facilities, etc. To add to this, there is a large incidence of illiteracy and school drop-outs, particularly among girls. The major needs of the State are basic infrastructure and a change of mindset of the people towards education, women’s rights, community involvement, etc. NBJK was founded by 4 engineering students in 1971, and has developed a distinctive combination of professionals and social activists/volunteers who work at its various field offices for implementation of different developmental activities. The professionals have been recruited from XISS Ranchi, XIMJ Jabalpur, XIM Bhubaneswar, Vishwa Bharti/Shanti Niketan, IIRM Jaipur and other reputable management institutes across India. At present, there are 511 well-qualified staff members serving NBJK from various disciplines, such as engineering, medical, eye care services, rural development, management, agriculture, media, commerce, environmental science and psychology. NBJK representatives have been included in various prestigious forums such as the Governing Board of the Credibility Alliance, National Literacy Mission Council (Ministry of HRD), Steering Committee on Voluntary Sector (Planning Commission), Executive Board of INAFI (International Network of Alternative Financial Institutions-India), etc. Nav Bharat Jagriti Kendra is registered with the Credibility Alliance and Give India.